I have never heard of a book Robopocalypse. Is that title intriguing or stupid? I have no idea who Daniel Wilson the author is. Another one of a zillion would be science fiction authors attempting to get on the New York Times Best Sellers list? However when I see the name Steven Spielberg, well, now you've got my attention. Daniel Wilson is all of 33 years old but already seems to have quite a bit under his belt: a B.S. in Computer Science from the University of Tulsa (2000), a M.S. in Robotics, another M.S. in Machine Learning, followed by a Ph.D. in Robotics (2005) from Carnegie Mellon University in Pittsburgh, Pennsylvania. Hmmm, can I see where this one is going? “The purpose of this book,” Daniel Wilson writes in the introduction, “is to prepare you for the future robot uprising.” And he’s only half joking. Wilson, who has a PhD in robotics from Carnegie Mellon University, tapped top scientists to complete his exhaustive list of realistic tips for surviving a “kill all humans” android insurrection. The result is equal parts sci-fi send-up and technical primer, blended with enough skill to land the 28-year-old two more book deals and a movie option from Paramount. Bookstores make the mistake of filing this under humor, but as Wilson says, “lots of government agencies hire researchers to build real killer robots.” So be prepared, just in case. It would seem that while Mr. Wilson can write and do so in a way to capture the interest of the reader, he also has the technical chops to back up his writing with a factual accounting of his chosen topic. From there, the author has come out with a number of books: Where's My Jetpack? (2007); Bro-Jitsu: The Martial Art of Sibling Smackdown (2007); How to Build a Robot Army (2008), etc. While one can sit back and admire this productivity, what's really interesting is how this gentleman has quickly risen in the ranks of those who are generating interest in the movie business. According to Wikipedia (http://en.wikipedia.org/wiki/Daniel_H._Wilson), Wilson's work has attracted so much attention he is being optioned by various production companies. How much attention? Robopocalypse was published on June 2, 2011 however Wilson sold the rights to the book to Doubleday back in November, 2009 then apparently sold the film rights the very next day to DreamWorks SKG with Spielberg to direct. Talk about buzz. Robert Crais, an American novelist and screenwriter of some repute, reviewed the Wilson novel on Amazon and wrote, "Robopocalypse is as good as Michael Crichton's Andromeda Strain or Jurassic Park, and I do not invoke Mr. Crichton's name lightly." What? That good? Crichton good? Do I now understand why Spielberg's company bought the rights to the book before it was even completed? Heck, how can I and a zillion of other people forget the Crichton slash Spielberg opus Jurassic Park? Now there was a ground breaking or maybe ground shaking cinematic event. According to various sources (Entertainment Weekly, MarketWatch), the film adaption of the book will be released on July 3, 2011. How good will it be? If the book is garnering praise like comparing the author to Michael Crichton and Spielberg buying the rights before it was even published, our expectations can run high. After all, Rotten Tomatoes has accorded some excellent rankings to Spielberg films: Jurassic Park 88%, Minority Report 92%, War of the Worlds 74%, Close Encounters of the Third Kind 95%, E.T. 98%. We could go on and on but it is pretty self-evident from this gentleman's output that his touch is gold. As I said, Daniel Wilson seems to have the technical chops to back up his fiction. Yes, fiction comes from the imagination - we are making stuff up - but good fiction has grounding in reality. Connecting a story to our own lives makes the story that much more captivating. The web site io9 published an article written by Daniel Wilson where he detailed some of his novel while typing it back to real-life research. "Behind the Fiction: The science of Robopocalypse" first gives a short excerpt from the novel then explains a robot called the stumper, what Wilson labels a crawling landmine. He provides footnotes to scholarly papers about the research conducted on the ideas of this stumper robot. While a good story has to be, well, a good story, the background material can make for fascinating reading as you realize that this impossible science fiction tale has more "possible" than you would think. Published on June 7, 2011. #13 on the list of New York Times Best Sellers as of July 26, 2011. Who's going to buy a copy of this book and read it? Okay, let's recap. Arguably one of the best directors in Hollywood with one of the most successful string of blockbuster movies, Steven Spielberg, buys the rights to this book before it is even finished and signs on to direct the film adaptation of it. Does anybody need any further convincing? 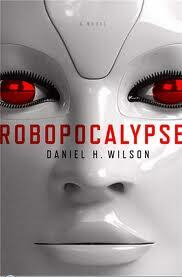 Robopocalypse is a New York Times best selling science fiction book by Daniel H. Wilson published on June 8, 2011. Daniel H. Wilson (born March 6, 1978 in Tulsa, Oklahoma) is a New York Times best selling author, television host and robotics engineer. He currently resides in Portland, Oregon. His most recent novel, published on June 7, 2011, is Robopocalypse. I am a writer living in Portland, Oregon. Robopocalypse is as good as Michael Crichton's Andromeda Strain or Jurassic Park, and I do not invoke Mr. Crichton's name lightly. ... In lesser hands, the story could have been head-shot with pseudo-science technical jargon, overwrought explanation, and cartoonish characterizations. Instead, Wilson has given us a richly populated and thrilling novel that celebrates life and humanity, and the power of the human heart . . . even if that heart beats in a machine. - Review by Robert Crais, 2006 recipient of the Ross Macdonald Literary Award and the author of many New York Times bestsellers, including The Watchman, Chasing Darkness, The First Rule, and The Sentry. #13 ROBOPOCALYPSE, by Daniel H. Wilson. (Doubleday, $25.) An artificial intelligence program takes on the persona of a human boy and sets off an apocalyptic robot uprising that could decimate the human race. An inspired and hilarious look at how humans can defeat the inevitable robot rebellion—as revealed by a robotics expert.